Greek and Roman Helms from Generic to Historically Accurate. Roman Period Steel and Leather Armour. 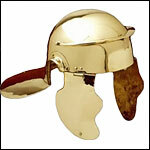 Roman Military Gear and Equipment suitable for display or Re-enactment use.